herr haible 1 board pls! I wish I had a Synthi on my workbench! My primary interest in this module is to get into k-strong stuff. For that purpose does anyone have any thoughts about using this flanger - vs the doepfer A-188-1? Would either module be better or worse suited for physical modelling experiments? Also - are there other circuits around that can serve this purpose as well that I've overlooked? I know the out of production blacet time machine could do it - and the modcan flanger (too much $$!). I don't really know of any others. . .
We are currently in Playa San Juan near Alicante in Spain where the temperature has hovered on a max of 35C since we arrived last Thursday. The icing on the cake of course would be to study the schematics of this beast whilst lazing on the beach. Never mind, my mother waited 9 months for me so I can wait!!! I'm glad that I'm not the only one who works in a mess Jurgen! I'm glad that he's not running out of solder! Nice Demo, Jürgen, wild thing. Can you please demo the 1V/Oct abilities of the flanger? Some sort of Karplus-Strong things? Would be great. Yes, an amazing demo, the sound is very clean indeed. I have put up the schematics meanwhile. I run the BBDs at a rather moderate level and put them inside that compander and germanium-diode-limited resonance loop of the ARP Quadra phaser. me too, very interested in Karplus Strong only Demos ! Many thanks for the schematics, I've just discovered the black ink has run out on my printer so I'll have to wait until Monday to print them out when I'm at work on A3 . Jurgen, the BBDs are showing as TDA 102, has a text box shrunk or something? 1022 - thanks, I just fixed it. The 3rd one is a combination of my wavefolder and the SoST Flanger in a feedback loop, self-oscillating. Not as good as my old PM experiments by far, IMO (see http://www.jhaible.de/jh_ana_phys_mod.html). These were made with the old Storm Tide Flanger. But I could never reproduce them with the old one either - I guess it was just a lucky day then - this stuff is very sensitive to all parameters. And generally, the SOST has basically the same signal path as the old ST, so there should be not much difference. Jurgen, I don't know if you intend to include a description of "how the various sub modules are connected up" on the SOSTF page on your site - it would be very helpful if you have the time. Being a simple accountant ( ) I'm struggling on this one! 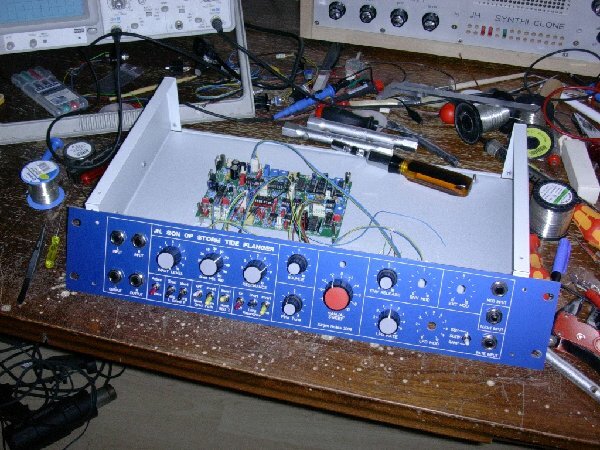 I sent you an email about this, but I'm planning to get 1 PCB for this project and 1 for the Polymoog Resonator project. I would really like to be able to combine shipping for these, since you charge a flat shipping rate regardless of the # of boards ordered. Since it sounds like these projects will be coming out somewhat close together, is there anyway I could do that with these 2 projects? I'd be willing to prepay for either both or the first project that's ready if it's not too much trouble for you to put a board aside for me then when the 2nd project is ready ship both boards to me. Really looking forward to both of these projects. You can *either* pre-order the latest project and then get it as soon as it comes out - in that case *no* combined orders are possible. *Or* you can wait until the shipping flurry of the latest project is over - when I have time between projects, I'm shipping combined orders. So it's either wait and combine, or be among the first ones and pay individual shipping. I will not delay any orders, but you can cancel them and re-order later. I would like 5 pcb's of the storm flanger,but i want to buy them in a combined package togheter with the resonators and solina boards as soon u release them,should i pre-order then the 5 flanger boards to be sure u made enough of them to be able to buy 5 when i will ask u for the combined buy?